Coaching youth football is a fun, challenging, and an absolute amazing experience. Seeing kids progress throughout the season as football players & individuals is the most satisfying element. Being a youth football coach comes along with many important responsibilities. 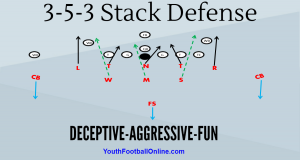 As a youth football coach, you are obligated to teach kids proper & safe football play. You must understand as a youth football coach that a lot of kids will look up to you. Your players will be a direct reflection of how you coach them. Coaches must realize that there is more to youth football than just winning. Coaching is about practicing & teaching your players the traits that will be needed to be successful throughout their life. The first and utmost responsibility for all youth football coaches is to teach safe & proper techniques for playing football. It is imperative to teach safe blocking, tackling and game awareness techniques. If coaches do not implement the proper techniques, injuries can occur. Coaches need an understanding about everything from hydration/nutrition to fundamental techniques for playing football successfully & safely. Prioritize your coaching staff on teaching proper techniques and coordinating practices safely (from water breaks to hitting drills). The last thing that you’d want to happen is have a kid get hurt because of lack of proper technical coaching. Football coaches should always demonstrate respect for their team members, opponents, referees, spectators, parents and opposing coaches. Coaches should remember that they are role models for many of their players. The best way to be a role model is to lead by example. Youth football coaches should be professional in operating practices, games, and dealing with parents. That includes being knowledgeable, informed, organized, courteous and look the part of a coach (dress appropriately). A coach is responsible for creating a safe & professional youth football environment. If you commit to coaching, you need to give 100% effort every single practice and game. You can’t tell the kids that you expect maximum effort when you do not give maximum effort yourself. Football coaches should be focused on creating a team atmosphere, among all coaches & players. Develop a sense of belonging, camaraderie, and commitment among the players. Encourage group activities, such as team dinners, professional sporting events, and volunteering for community projects. Teach your players about responsibility, coming to practice and games on time and ready to work hard (just like they will need to do as they evolve into adulthood). Youth football is not just about winning or losing a game. Youth football is about teaching; discipline, teamwork, hard work, & commitment to something greater than one’s self. Youth football coaches should give nothing but 100% to each player on the team, do not overlook any child! Coaching youth football is comprised of volunteer parents, so coaches should expect nothing but 100% effort from their kids as well. Coaches should never tolerate lack of effort, unexcused lateness/absents from team activities, or negative behavior towards teammates & coaches. I say it again, because I cannot express how important it is that the main priority should be the safety of the kids. Youth football coaches / players should always exhibit good sportsmanship. Do not allow offensive language, cheating or fighting among teammates or to opponents. Make sure your players understand the difference between aggressive and hostile play. Aggressive play is playing physically within the rules with the intent to win and do ones best. Hostile play is excessive roughness with the intent to injure. Trying to injure another player should never be tolerated. There is no pride in winning a game by breaking the rules or causing purposeful harm to other players. Coaches should always preach the importance of teamwork, discipline, hard work, and commitment; which is all traits needed to grow as an individual and things that are needed to be successful in life. If you operate practices with professionalism, safety, and a team first atmosphere, then your season will be something the players and coaches will always remember. The youth mind is moldable; coaches should lead by positive example. The responsibilities stated above are guidelines that my staff and I coach by.